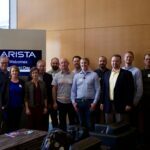 This video is part of the appearance, “Arista Networks Presents at Networking Field Day 16“. It was recorded as part of Networking Field Day 16 at 15:30 - 17:30 on September 13, 2017. Ken Duda, Founder, CTO and SVP Software and Engineering at Arista, has worked in networking for decades, but is a programmer at heart. He reviews the how the EOS architecture is different from other switches, starting from it’s simplified single binary image. This allows for standardization across an entire environment. This is enhanced by their state oriented approach, which allows for off-box programmability. All of this is backed by a commitment to “true” Linux with an off the shelf Linux distribution.